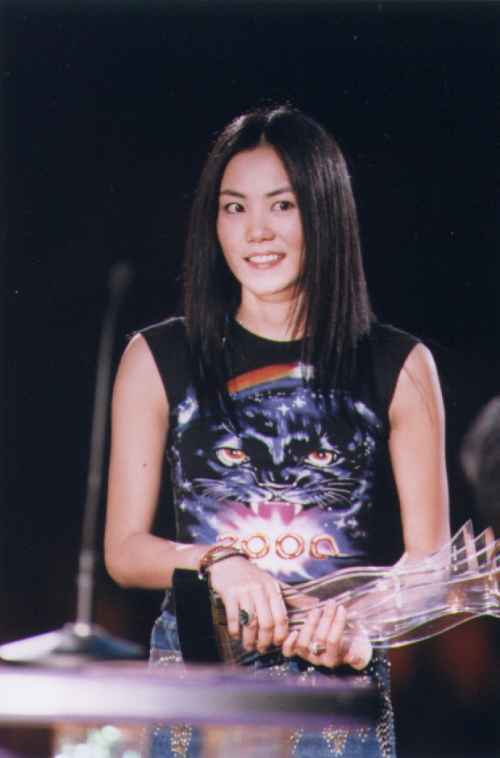 31 May 2000 -- Show8 has a bunch of pics from Faye's new Pepsi cm shot together with Aaron Kwok. For those of you who don't know who Aaron is, he is one of four main male stars in HongKong together with Leon Lai, Jacky Cheung and Andy Lau. If you want to see the pics, click here. If you want to read the article, read it here. 31 May 2000 -- So, finally it's confirmed: Faye and Nic Tse are dating, managers on both sides confirms it. If you read Chinese, take a look at Show8 here and here. 29 May 2000 -- Not so much to report ... If you are interested how much Faye's latest outfit costs, go to Easyfinder to find out. Also, a second cm for Pepsi has been shot, I hope we can see it soon. 23 May 2000 -- There are 2 new J-phone commercials to download. I like the cop best ... Get them now and judge them yourself! Clip 1 || Clip 2. This is Faye's 4th movies and finally she is paired off with Leslie Cheung in the movie "Holiday Cop". So how she feels about this? Faye replied that no matter who the actor is, she'll definitely feel nervous in filming. She also disclosed that she'll have some love settings with Leslie in the movie. "Holiday Cop" is a film invested by China star. So is Faye interested in going further into filming? Faye replied that filming is too tedious for her. Singing will still be her priority. Earlier on, Tony Leung and Maggie Cheung have said that acting in Wong Kar Wai's movie is tedious... so how does Faye feels about this? Faye said that she always act according to the director's instructions... so she don't feel any additional pressure in Wong Kar Wai's movies. The reporters also told Faye that the area she'll be in in Japan is having some strong winds. Faye said she didn't know about it. When asked if she'll play mahjong during her leisure time over there. She said that she hasn't been playing mahjong for a long time! Of course she was asked about She and Nicholas... but our Faye replied..."do you think I'll talk about it?" 18 May 2000 -- If you're looking for Eyes on me mtv with FF8 characters only, click the link to download (5 MB). I love this video so much, it's truly awsome when I play my mpeg-file on my 19" monitor fullscreen. Get it! Source: Unanimously Faye Is The Best! 14 May 2000 -- A third teenage album by Faye is available for download, thanks to c who got a hold on the CD. Go to Singapore Fayenatics Home to download those 10 songs and enjoy! You can download the previous two teenage albums here as well. 14 May 2000 -- Didar also have some news about Mother's day and upcomming projects of Faye, you can read them below. And don't miss her tribute page for Mother's day. "Tongtong will be giving Faye a special & mysterious gift!!! So sweet when I read that. Faye is very low profile currently 'cos she's at home writing songs. She's listening to music everyday now to get some insprication. As we all know, Tongtong also loves music very much, she's so excited to see Faye at home composing music & she's dancing along with it. She even told Faye that she'll make a gift for Faye in her nursery school for Mother's Day. Faye also arranged all her work schedules to be after this important day loh'cos she wanted to spend time with her beloved mah. She'll go Japan in late May with Leslie Cheung to film Holiday Cop & another series of the jphone cm. So she can have a good time with Tongtong on Mother's Day. Katie when interviewed confirmed this. She said Tongtong is very obedient & smart, Tongtong herself said she wanted to make a present for Faye in nursery school. However Katie said the paparazzi better not go & take pics ah 'cos she's still such a small kid, will frighten her. She added that Faye is busy writing songs now, but will stop her work & spend time with Tongtong on Mother's Day, after that she has lotsa work, movie, cm & concert tours etc." 14 May 2000 -- If you live in Nanjing, China you're lucky, Faye will hold an concert in your city on June 26! 14 May 2000 -- Sometimes it's nice to be a Fayenatics, like when you see a newspaper article liks this one. 7 May 2000 -- I have to go to Houston, Texas on a buisness trip this week so there will be no updates until 15 May. Sorry about that. 4 May 2000 -- This page is cool, J-phone has a whole section about Faye. Take a look! View some new J-phone pics of Faye here. 3 May 2000 -- Show8 has an article about Faye and J-phone including two videoclips of her earlier cm. If you don't read chinese and just want to see the clip, click below. You need ReadVideo to see them Clip 1 || Clip 2. 1 May 2000 -- A second set of pictures from "Hong Kong Film Awards" is ready and can be downloaded now, thanks to Steve. Download (1,1 MB). 1 May 2000 -- Faye has done two more cm for J-phone, reported by Oriental Daily News and Sina Taiwan.You can view two news pics on my J-phone page, one with Faye dressed up as a cop! Also, take a look at this newspaper scan. Faye has done another new series of ads for J-phone. This is their 3rd time working together. The Japanese company has brught along a strong 40 manpower to HK for the cm shoot. Regardless of the expense, they had created an elaborate and expensive studio scene, the production cost is indeed very high and of course Faye "price" has increased by another level as well. Its said to be a 8 figure sum now. In this new series cm, Faye has 2 new looks, 1 is a cybercop!!! and another one is cyberlook new generation female. This group of people has worked with Faye before, the director thinks that Faye is a highly flexible girl, she can be easily moulded into different characters and she can easily adapts to her characters very fast and convincingly as well. The director likes it very much 'cos this means cancreate a lot of different images for Faye. He thinks that Faye is very pretty indeed, hence he won't try any funny stuff on Faye face, her natural look is already very captivating. Japanese are well known for their good production, just like in this cm, the supporting lead against Faye came fm Japan, they're all being selected carefully to pair with Faye. Besides the 2 tv images, Faye also had a photo shoot for 5 different images, all are different and all are of its own distinct flavour. It was also reported that eversince Faye become the spokesperson for this j-phone, in Kansai area, she has helped to push up the sales. This is 'cos a lot of people look upon Faye as the new fashion generation spokesperson. J-phone people also likes to listen to Faye music, for this new series cm music, they've specially chosen Faye OLS to be the background music." Thanks for the Fayenatic that translate for me."